1) Mama Didn’t Raise No Fool- Magic WARMUP Start with stretching on the bike while picking up your RPMs. Increase your pace as you loosen up your legs and arms. 2) Honey I’m Good- Andy Grammer SPRINTS The first set of sprints should be standing with moderate resistance in 15 second increments with 15 second recovery. 3) Centuries- Fall Out Boy CLIMB The first climb should be standing from start to finish. Start with a low resistance and add resistance every 15-20 seconds until reaching the top of the hill. 4) Shake Ya Tailfeather- Nelly JUMPS In counts of 4 seconds, start in a seated position with moderate resistance. On the chorus take it up (standing tall), back to a hover position as far across the saddle as you can and back down to the seated position. Repeat on the choruses staying seated on the verse. 5) Hall of Fame- The Script CLIMB Staying seated start at a moderate resistance adding resistance taking it to the max gear on the bike. When you reach the top, take up to half the resistance off and pick up the RPMs. Time for a downhill ride! 6) Bang Bang- Ariana Grande SPRINTS Heaviest sprints of the ride with moderate to heavy resistance. Alternate between 20 and 15 seconds taking 10 to 15 seconds recovery. 7) When You Were Young- The Killers CLIMB Start the climb seated but as you increase the resistance, alternate between sprinting up the hill and slowly pedaling through the resistance. 8) Yeah- Usher JUMPS In counts of 4 seconds, start in a seated position with heavy resistance. On the verse take it up (standing tall) and then back to a hover position as far across the saddle as you can. On the chorus, stay standing nice and tall and increase the pace on your legs. 9) On The Floor- Jennifer Lopez SPRINTS Starting with low to moderate resistance, increase resistance with each sprint until heavy resistance is reached. Sprints should alternate between standing and seated. 10) Really Don’t Care- Demi Lovato JUMPS In counts of 8 seconds, start in a standing position with moderate resistance. On the verse take it up (standing tall) and then back to a hover position as far across the saddle as you can. On the chorus, stay standing nice and tall and increase the pace on your legs. 11) Right Round- Flo Rida SPRINTS Last set of sprints should be standing with low to moderate resistance. With the lower resistance, increase the sprints to 20 second sprints with 10 seconds recovery. 12) Fancy- Iggy Azalea CLIMB Last ride should start at a moderate resistance adding until the top of the hill. When you reach the peak of the hill, reduce the resistance every 10 to 15 seconds until you reach your flat road. 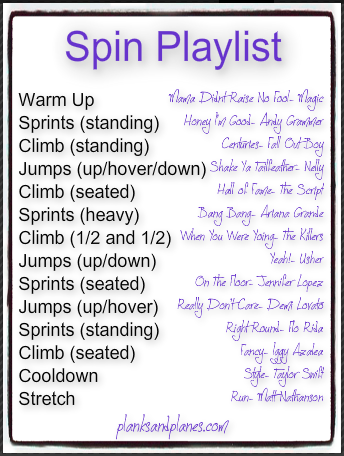 13) Style- Taylor Swift COOLDOWN Slow RPMs and heart rate down as you begin to slowly decrease your pace. As you slow your legs, stretch the arms, shoulders and core before you stretch the legs. This entry was posted in Cycling, Fitness, Playlist, Spinning, Workouts and tagged Cycling, Fitness, Playlist, Spinning, Workouts. Bookmark the permalink.